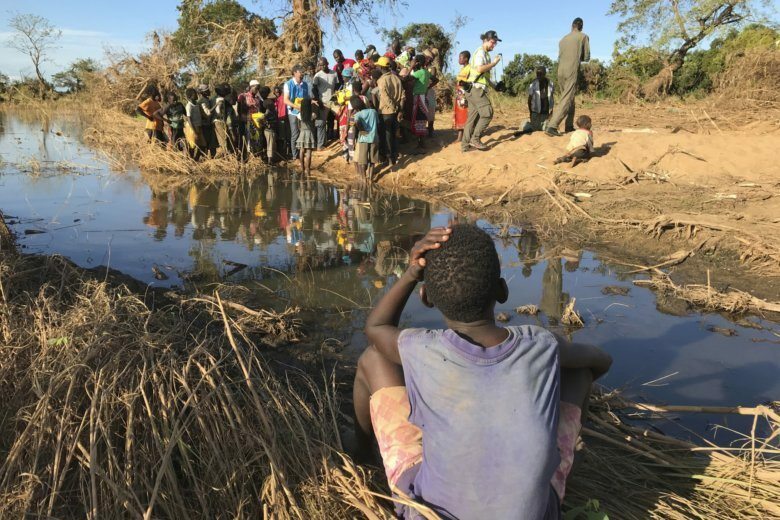 The raging floodwaters that left a large part of central Mozambique a vast inland sea are draining away, laying bare a severe lack of food for the months ahead. BOPIRA, Mozambique (AP) — Mozambique’s first disaster was a cyclone. The second has been cholera. Now hunger could be the third. Low-lying rice fields in this fertile region were destroyed when rivers burst their banks. Maize crops on higher land were shredded. Their mangled stalks now wither under an almost constant sun. Exposed, the clay earth is cracking. Cyclone Idai swept in from the Indian Ocean on March 10 shortly before thousands of subsistence farmers planned to bring in the harvest. “People are hungry because there is no produce. Look at the fields,” teacher Lino Luciano Munere told The Associated Press in Bopira, a village reached by helicopter for just the third time with aid, nearly a month after the storm. West of the hard-hit town of Buzi, it remains cut off by road. “I don’t know what we did to deserve this,” he said. A narrow window of time for farmers to put a shorter-term crop into the ground such as beans or green corn is quickly closing, with about two weeks left. Such a “second harvest” normally accounts for just 10 percent of annual food production, the United Nations’ World Food Program said. Farmers say they would be happy to plant if they had any seed, or hoes. Their very homes were often washed away by a storm that left curious traces: An intact thatched roof draped over a tree like a limp umbrella; a house collapsed but for the metal door, upright and still closed. More than 715,000 hectares (1.7 million acres) of crop fields were flooded, according an update released Sunday by Mozambique’s disaster management agency. No one speaks of famine as long as aid groups keep delivering basic food like flour and cooking oil to survive, but they warn of a lean season for months to come. That season will start “atypically early in August” and continue into early 2020, the Famine Early Warning Systems Network said over the weekend, adding that local seed prices could rise. This is in a country where even before the cyclone more than 40 percent of children were physically stunted, WFP said. Signs of malnutrition among some cyclone survivors in displacement camps could be aggravated by the cholera outbreak, WFP added. These are families who have no second source of income and supporting them until the farming cycle returns to normal will be a year-long project, said Jaco Combrinck, part of an impromptu relief effort run out of a farmhouse in Matarara. “The crops they are planting now won’t be enough but it will be something,” he said. The cyclone relief efforts have focused on keeping people alive, addressing the immediate needs: Food, water, shelter. Even now, air relief efforts are still looking for communities that have not been reached with aid. On Monday the U.N.’s Food and Agriculture Organization with partners is expected to begin distributing more than 180 tons of “second harvest” seeds, plus tools, to some 18,000 subsistence farming households, the U.N. humanitarian agency said Sunday. Providing seeds alone while everyday needs remain urgent might tempt some hungry people to eat them, said a close observer of the air relief operations. He watched one woman throw herself on a bag of flour during a food distribution, scared that someone else might take it. Subsistence farmers, many just as protective of their land, can be seen in the ruined maize fields salvaging kernels to start another crop as best they can. Nineteen-year-old Rahul Chavel now lives in a tent with his parents. Their maize crop is horizontal and bone-dry. The clay pot in which they made traditional beer is partially submerged in hardened mud. “We even lost all our chickens,” the teen said, still in the tattered red slippers and rolled-up black pants he wore when he climbed up a mango tree to escape the floodwaters. His family is trying to salvage what they can, he said. But almost nothing remained.